Do you want to start a business? Do you want to access a loan/grant from Bank of Industry (BIO), Commercial bank or Agribank? Looking for an investor to fund your business? Want to source where to buy locally fabricated or imported production machinery of different capacity? Call +2347030722911 for detailed inquiries. You’ve got a business idea. You’ve decided to start a business in a small or large scale. You want to get going but don't know where to begin. There’s a lot more to a good business than a good idea. You need to think things through to maximise your chances of success. Are you the right person to run the business? Will customers like your product? A business plan will help you turn an idea into a business. It needs you to think through all the parts of your business to plan how everything will work. It will take a few weeks to write if you’re going to do it properly. Some parts will be easier to complete than others. Stick at it because it’s not the final document that’s important, it’s the process. Although you want to have a good plan when you’re done, an OK plan is better than no plan. The best business plans aren’t long and complex; they explain only the most important information – what you want to achieve, how you will get there and the things you need to do along the way. It’s best to tackle a business plan in small chunks. 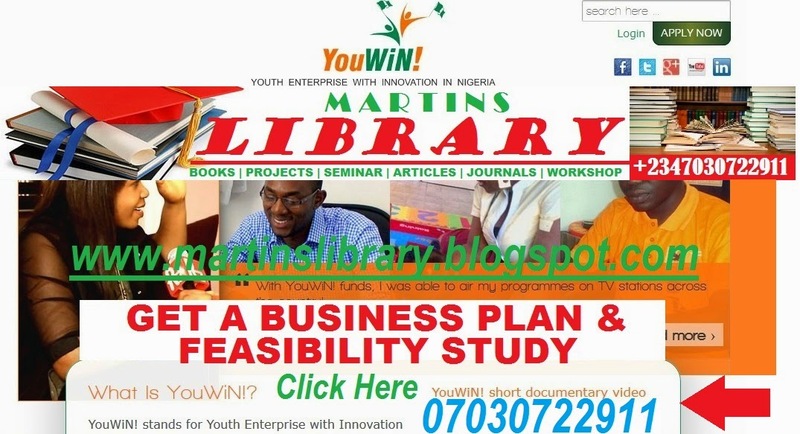 Martins Library Business Plan Pack can help. This is the Business Plan divided into sections to help you develop your business idea. You can use the information in the Guide to help you complete the sections. Some of the sections of The Business Plan have tables to record the financial parts of your business. The tables are also available in MS Word and MS Excel format and the sums in these are automatic. Martins Library has helped many young people to complete their business plans and start their own businesses. If you are aged 18–30 and unemployed or working fewer than 16 hours per week, then we might be able to help you. We have offices in Nigeria with a team of Enterprise Programme & Expert staff. To take part, you need to be interested in self employment and have a business idea that you would like help to test and explore. The programme can then help you to see if your business idea will work and whether self employment is right for you. If through this process you find out it is, the programme can offer mentoring support and, if you really need it, financial support to start your business. However, if self employment turns out not to be the right option, the programme can offer support to secure other goals in employment, education, training or voluntary work. We can’t guarantee that your business will work without a business plan or that we will be able to offer you money, but if you are up for a challenge and want our help to explore your business idea, get in touch by Contacting Us Today.